The three year drought in California from 2012 to 2014 has been the most intense in at least 1,200 years, according to a new paper published in the journal Geophysical Research Letters by climate scientists. The scientists, Daniel Griffin, an assistant professor in the Department of Geography, Environment and Society at the University of Minnesota, and Kevin Anchukaitis, an assistant scientist at Woods Hole Oceanographic Institution, studied ring cores of blue oak trees collected from southern and central California. These trees are considered good rain gauges because of their high sensitivity to moisture which is reflected vividly in the tree rings, the scientists were quoted as saying in a website, phys.org. They also estimated the severity of the drought by comparing data from the North American Drought Atlas and National NOAA’s estimates of the Palmer Drought Severity Index, an estimate of available soil moisture, to compare the present drought with previous droughts over a millennium. While the current level of rainfall deficit is not unusual but when combined sustained high temperatures, it led to the current, prolonged drought, says the report. 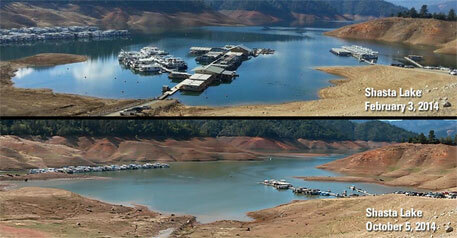 Another study, conducted by Stanford University, has, meanwhile linked the California drought to climate change. The scientists who carried out the research observed that the atmospheric conditions associated with the drought are 'very likely' linked to human-caused climate change. The scientists used computer stimulations and statistical techniques to show that a persistent region of high atmospheric pressure hovering over the Pacific Ocean that diverted storms away from California was much more likely to form in the presence of greenhouse gas concentrations. "Our research finds that extreme atmospheric high pressure in this region – which is strongly linked to unusually low precipitation in California – is much more likely to occur today than prior to the human emission of greenhouse gases that began during the Industrial Revolution in the 1800s," said lead author Noah Diffenbaugh, an associate professor of environmental Earth system science at Stanford and a senior fellow at the Stanford Woods Institute for the Environment, said in a Stanford news report. The UK Met Office, has meanwhile, predicted a 10-fold increase in warm summers and heat waves in Europe because of climate change. The findings published in online journal Nature Climate Change, says warm summers will increase from twice a century to twice a decade, while extreme heatwaves like the one experienced in 2003 that is estimated to have killed 70,000 people in Europe, will occur once a century instead of once every 1,000 years. The study defined an extreme summer as one that is 1.6 degrees Celsius (2.9 Fahrenheit) above the average for 1961-90. In the last decade, average summers in Europe have warmed by 0.81 degree C, the study says. And if emissions continue to rise, the occurrence of heatwaves could increase further to every other year by the 2040s. Severe heatwaves in the past decade such as the ones in Moscow in 2010, Texas in 2011 and the Australian ‘angry summer’ of 2012-2013 were characterized by long duration, large spatial extent and catastrophic impacts.